A one-pot dish that's easy to prepare and serve a crowd. 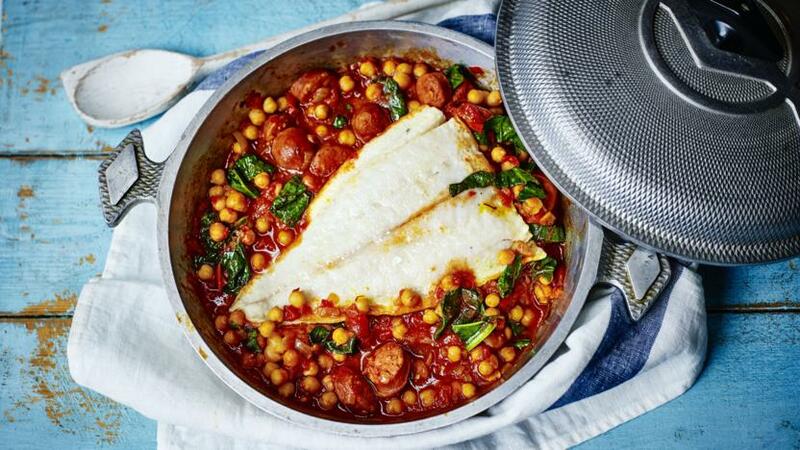 Pollack is a cheaper variety of white fish and is perfect for poaching in the flavourful stew. Soak the dried chickpeas overnight in a bowl of water. Drain the chickpeas and place in a large pan, cover with water and bring to the boil. Lower the heat and cook for two hours, or until the chickpeas are cooked. Remove from the heat and set aside to cool in the water. Lay out a large piece of cling film on the counter. Mix the rock salt and saffron together and sprinkle half of it over the cling film. Place the pollack on top and sprinkle the remaining salt mixture over the top. Wrap tightly in the cling film and place in the fridge for 1½ - 2 hours. Place a casserole on the heat with the olive oil. Add the onions, grated garlic and red chillies and cook over a medium heat for 6-8 minutes, or until the onion has softened. Slice the chorizo into bite-sized chunks and add it to the casserole. Cook for a further five minutes, or until the red paprika oil renders out of the sausage. Add the cumin, paprika, bay leaves and cinnamon stick. Cook for a further 3-4 minutes. Preheat the oven to 170C/325F/Gas 3. Drain the chickpeas and add to the pot with chicken stock and tinned tomatoes. Bring to the boil and cook in the oven for 45 minutes. Remove from the oven and season to taste with salt and freshly ground black pepper. Wash the pollack thoroughly under cold running water. Pat dry and place on top of the chickpeas. Transfer to the oven for 12-15 minutes, or until the fish is cooked. Remove the casserole from the oven. Gently lift the fish from the pot and place on a large serving plate. Stir the spinach into the hot chickpeas until it is just wilted. Remove the bay leaves and cinnamon stick. Spoon the chickpea mixture over and around the fish and serve.